Parade marking the arrival of the Three Kings in the city. Traditional popular festival which takes place in Chiclana's streets. 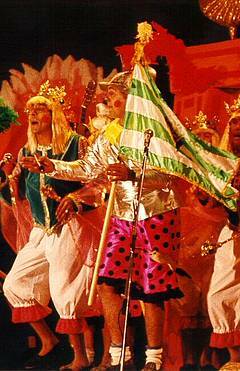 Fancy dress competitions and comedy and songs satirising local, national and international events. There is a big parade on the 2nd saturday of carnival. 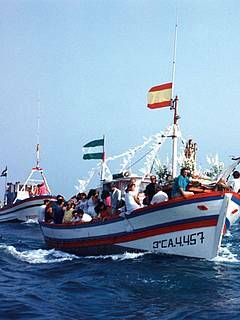 Popular and religious celebration, with processions through Chiclana's most picturesque streets as well as the famous "saeta" (short sacred song in Flamenco style). Originally a cattle fair, this is now the most representative celebration in the town. 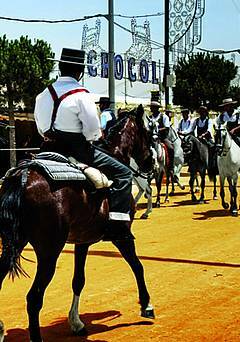 Eating, drinking and dancing "sevillanas" are the main activities in the marquees on the fair ground which become a second home to people from Chiclana during this period. Popularly known as the feast of "Juan and Juana", in the preceeding days huge figures are built to satirise topical events in the city. On this night, the figures are burnt and snails are served as a traditional "tapa" dish at local bars. Procession (called "La Banda") that starts and finishes at San Sebastián Church. Procession from the "Capilla del Carmen"(chapel) in "La Barrosa" Beach to Sancti-Petri, where the procession takes to the sea going from Sancti Petri beach to La Barrosa beach. Great street party with fabulous fireworks from the Ermita viewpoint. 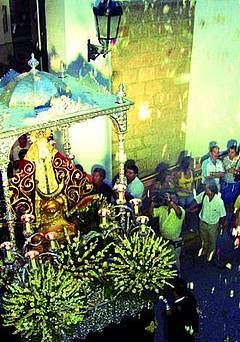 Chiclana celebrates this day by offering flowers to the patron saint and with a long procession from San Telmo Church. There is traditional grape treading in honour of the patron saint. This festival has recently been revived. The main attraction is a display of decorated market stalls in the town's market place. Scenes of political or popular significance are recreated using- fresh products including meat, fish, poultry and vegetables. "Saint's bones", a traditional sweet, are commonly sold and eaten at this time of the year. Every year the Christmas celebrations in Chiclana are surrounded by a special touch of magic and from the very first days of December the streets in the centre of Chiclana show their traditional Christmas lighting. The city is in full splendor and is getting ready with a wide and selected programme which includes concerts, ice skating, street animation, theatre, Christmas carols, Flamenco "Zambombas" and many more activities to enjoy with the whole familiy, as a couple or just simple with friends. During these days it has become a steady tradition to go shopping in one of the numerous Christmas stands of Chiclana, follow the nativity route, visit the "living" Nativity play and of course try the many delicious Christmas pastries. An excellent opportunity to enjoy Chiclana at this special time of the year.